Brooklyn-based guitarist Stelios Mihas will be presenting a jazz trio featuring legendary reeds player Daniel Carter and bassist Zachary Swanson. 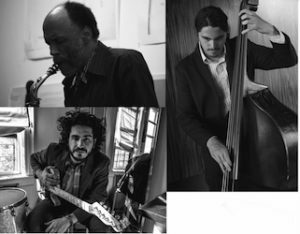 After meeting during the sessions of Daniel Carter’s Listening Group, this trio will be performing its spontaneous compositions drawing inspiration from late 20th century jazz and contemporary music traditions. Here’s a sample of Stelios Mihas’s music: click here to hear them play. Enjoy! Friday, July 8, 7:30-9:30 pm, please join us for an exciting evening of music when this great group performs at the Ink Well Cafe, 408 Rogers Ave, between Lefferts Ave and Sterling St.